? Groin injuries can take weeks to heal, especially for catchers since they spend so much time squatting behind the plate. Fingers crossed that the MRI brings relatively good news. The Yankees might be looking at an extended run with Romine behind the plate. 4:45pm ET: Well this is bad. 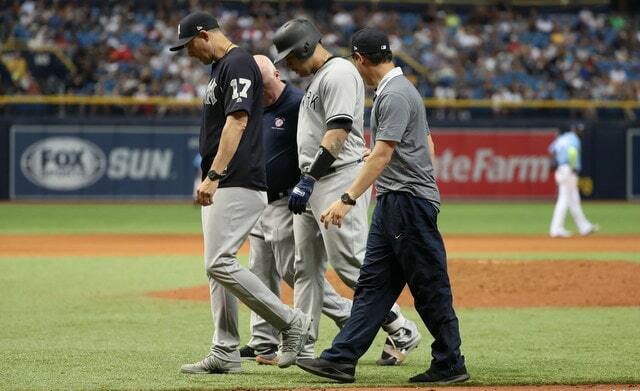 Gary Sanchez exited Sunday’s game with what sure looked like a groin injury in the tenth inning. He hit the first base bag running out a double play grounder and grabbed at his groin. He’s had calf problems earlier this season as well, so we’ll see what’s up. The Yankees have not yet announced an update on Gary. Sanchez has not had a Gary Sanchez season so far this year — he’s hitting .190/.291/.433 (97 wRC+) through 265 plate appearances — but he leads all catchers with 14 home runs and can still change a game with one swing. Plus he’s not going to snap out of the slump on the disabled list, you know? Hopefully this is something minor. Kyle Higashioka is the third catcher on the 40-man roster and he is the obvious call-up candidate should Sanchez miss time. He’s hitting .191/.265/.328 (66 wRC+) down in Triple-A Scranton, but he knows the pitching staff, and he can run into the occasional fastball. Still a big downgrade even from slumping Gary, to be sure.